Home Secretary John Reid has called for human rights laws to be rewritten to protect people against terrorism. In a speech in Venice to ministers of the six largest EU nations, he said the current situation was unacceptable. 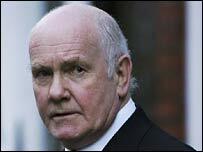 Citizens were not being protected by politicians who followed case law "to the letter", Mr Reid said. But Shami Chakrabarti, from Liberty, said human rights would be improved by encouraging freedoms, not by destroying legal frameworks already in place. Ms Chakrabarti, who is the director of the human rights organisation, said: "In this struggle, we have to work with allies around the world to make sure they up their game on human rights because terrorism is being bred in countries which have the worst human rights records. "We need to up their game - not dilute our great traditions of rights and freedoms." In his speech, Mr Reid told the summit, that the international legal system needed modernising and that the distinction between armed conflict and criminal acts was out of date. He said: "We need to work to modernise the law - still protecting human rights and still providing equity and justice - but reflecting the reality of the conflicts and struggles we now face. "We need leadership to do this. It can't be left solely to the lawyers. "Politicians must expose these issues and set a lead, so that we can protect the rights of all our citizens, including all those threatened by terrorism." Mr Reid said neither the law governing war nor civil law was well-suited to dealing with terrorism inspired by al-Qaeda following the September 11 attacks. "The right to security, to the protection of life and liberty, is and should be the basic right on which all others are based," he said. "Now, more than ever, it should be the fundamental starting point of all our principles and practices across Europe." Human rights laws have caused problems for the British government in its attempts to introduce anti-terrorism measures. These include emergency laws in 2001 which were defeated in the House of Lords, and courts overturning control orders which restrict the movements of terror suspects. The conference of home affairs and interior ministers is also being attended by US Homeland Security Secretary Michael Chertoff and EU security chief Franco Frattini. Mr Reid's speech on the island of San Clemente came three days after the Home Office was split in the UK. A new Ministry of Justice will leave the Home Office to concentrate on terrorism, security and immigration.